Woody Guthrie took the tradition of the troubadour and added his signature to the songs by making them topical. 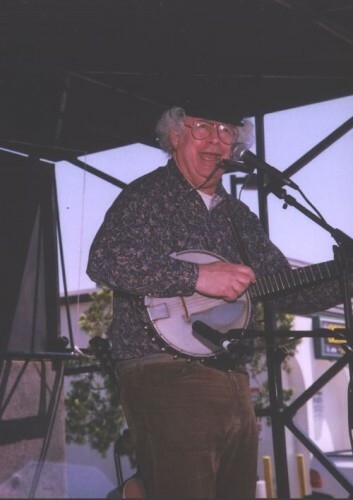 He sang about the masses of Okies seeking the promised land in California; his songs criticized McCarthy and the Red Scare; and his repertoire told stories about hard work and the hardscrabble life of the poor. His influence is immense. All the folk singers who graced the Greenwich Village coffee shops - Bob Dylan, Phil Ochs, and Tom Rush - owe it all to him. As a matter of fact, songs that address social issues or are topical in any way, no matter what the style, can trace some of their inspiration back to Guthrie. 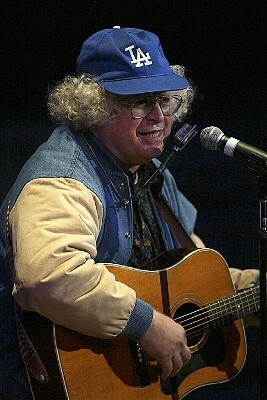 Ross Altman, known as a singer/songfighter, embodies this tradition. Photo by Larry Goren from Baseball from Flatbush to the City of Angels August 15, 2004.
from the 31st Annual Adams Avenue Roots festival. More recently I found this page on Ross at the Santa Monica Folk Music Club site.